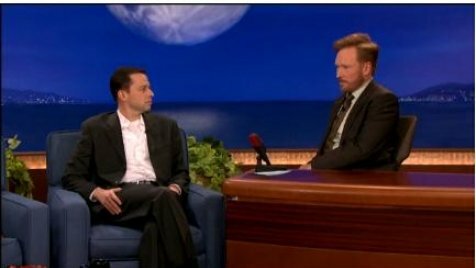 Jon Cryer made a confession about his hair during an appearance on Conan show yesterday. “This is an elaborate illusion,” Jon Cryer said pointing to the top of his head. “They basically just paint – they get a roller type thing – and just whoosh along the top,” the actor described while demonstrating painting his head. “You have to decide if you’re going to go full [John] Travolta and get the full front in,” he joked of the 59-year-old actor’s famous widow’s peak. What happens if he gets caught in the rain? “You’re out of luck,” Jon Cryer said with a laugh.